We’ve seen our fair share of TV adaptations about tales of the werewolf and even vampires, but are you ready to see a depiction of the weretiger, more specifically “Suea” (tiger)? 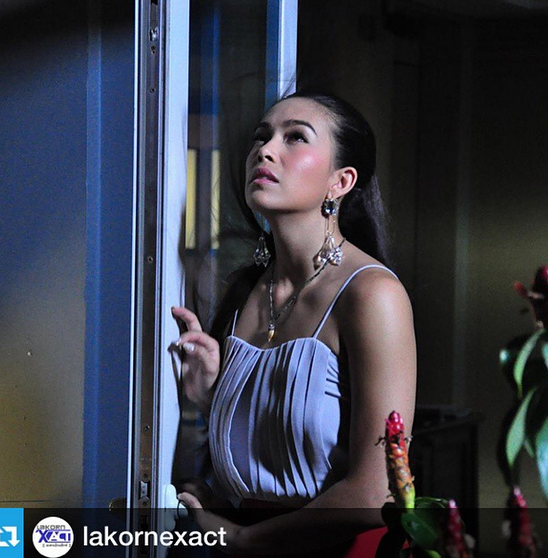 In this midweek lakorn lineup, Suea starring Taya Rogers, Nike Nitidon and Bank Cash, the weretigers are portrayed as dangerous sorcerers who are capable of shape shifting into the human form during a full moon the color of blood in order to lure humans and eat them. The wild animal keepers believe this wholeheartedly and we see them trying to hunt a male (Bank Cash) and female weretigers on the verge of mating. The only way to kill them is to aim for the heart. Unfortunately wrestling with a tiger brings several human’s demise, including Nachan’s (Taya Rogers) very own father. Little Nachan gets taken into the woods (perhaps under spellbinding powers from the female weretiger) where her father’s animal keeper finds her drinking the blood of the tiger, thereby infecting the poor girl. The female weretiger’s spirit dissipates into thin air leaving a dead tiger, while her mate flees Thailand to seek his prey elsewhere, awaiting the moment he will return to claim his new mate. Seventeen years later, Nachan grows into a beautiful and successful woman in her own right, working in the world of advertisement. On her 25th birthday, a fragile year as seen by many, Nachan finds herself with terrible fortune. According to a psychic, her life is going to be in grave danger, not only will she be stuck between heaven and hell, life and death, lover and foe, she will meet the devil himself. The wind blows, the lightning strikes, and the weretiger sniffs his inevitable return to Thailand, while Nachan finds her body shape shifting, eyes glinting, beneath the power of the full moon. Poor Nachan, she is like a deer caught in the headlight. Not only is she greeted with a disgusting pervert at work who threatens to terminate their advertising agreement if she doesn’t play nice with him, not to mention living alone, and missing her father, she is about to enter the scariest ride of her life: becoming a tiger. When the psychic mentions a man who will enter her life and wants to give his heart to her, we know she’s referring to our hero, Nike Nitidon, who plays a rich man who is groomed to take on his father’s business, but is more interested in the wild animal foundation. One look at Nachan, and our hero is head over heels. I haven’t seen an Exact or Channel 5 lakorn for some time, and I forget that the actors do real kisses. You know, real acting. Our tiger princess will be kissing not only the weretiger, but our hero. Now who would want to miss that? The legend is spooky, the filming has HD quality, and Taya isn’t too bad as an actress, seeing that she has been away from the lakorn world since Prisana. I’m sure the shakiness will smooth itself out as the story progresses. If you’re up for a sensual ride, this one is for you. It does sounds so tantalizing!!! This one is on my list to watch. I actually liked the old version, so I’ve been looking forward to this one. I’ve also been looking forward to Taya’s comeback (although I believe the last lakorn she did was Payak Sao Saeb Ee Lee in 2008). There seems to be more hot scenes in this version, too. So far it sounds really good. I haven’t watched Suea yet so nothing to say, but for PSSEL, I think I only caught the first episode (either that, or the first half of the first episode). I’m not sure now why I didn’t continue it. I might have been busy. I know my dad watched it. I only vaguely remember that Au Thanakorn is a cop (I think) who brings together 3 female criminals to fight crime or something like that. I mainly remember that Kat English sang the theme song. I don’t know why that stuck out for me lol.